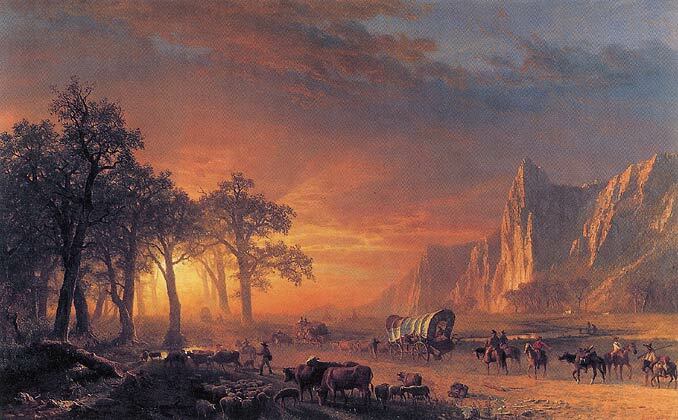 This essay provides a brief chronological overview of the visual evidence available for teaching about the American West. Lavender discusses some of the first representations of the region by the different populations that claimed it as their own, depictions of the West as a site of nineteenth-century U.S. expansionism, and visual materials that illustrate the complicated ways the region’s distinctiveness has been represented into the twentieth century. The first visual images of the West—first both chronologically and figuratively—are about marking one’s imprint on the land. Outlines of the human hand marked in relief or pecked into cliff faces with stones connect the paleolithic “discovery” of the West by its first peoples to the later waves of re-discovery that mark the region. 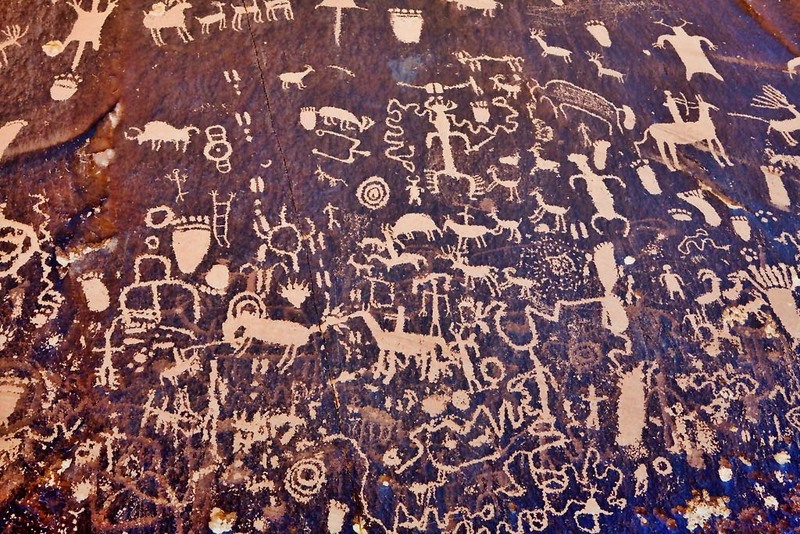 A chronology of this visual signature of the human presence in an awe-inspiring space stretches from these earliest beginnings through nineteenth-century graffiti left by soldiers and settlers on landmark outcroppings and on to the most recent visuals of the West in which family members stand smiling in vacation snapshots for the purposes of scale. To understand this contrast in scale between humans and place over time, let us look at a series of Western visual images that stake these sorts of claims to the land. One of my favorites is the paleolithic visual symphony known as “Newspaper Rock,” an explosion of collective pictography located in Canyonlands National Park in Utah. 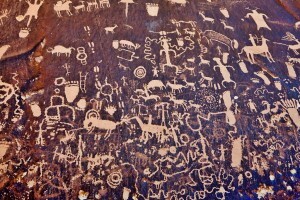 [Figure 1] Inscribed successively over the course of some 10,000 years, the site records the comings and goings of a number of diverse native peoples who from 8,000 BCE have called the West their home—settlers long before the place was called “The West.” While many of the images depict hunting, point out sources of food, and record both human hand prints and animal paw prints, they also include riders on horseback and modern graffiti additions—vandalism, yes, but also a reflection of a continued desire to mark one’s place on the land. The sweep of these images indicates the fluid and long history of the site. Newspaper Rock also stands as a symbol of public ownership of the place, not only because of the methods of production associated with the image (it has many authors, indeed), but also because the land on which it stands is now part of a federally-operated national park. In this, it reflects several of the distinctive elements of Western history: federal land possession, the continued presence of native peoples, and the desire to conserve natural and historically-significant landscapes on a scale rarely seen in other regions. The other significant thing about Newspaper Rock is the bridge it provides to its sister sites, produced by countless others who strove to call the West home, sites that continue to be created even in the current moment. One of these is Juan de Oñate’s famous 1605 “Paso por aqui” (“Oñate was here,” essentially) graffito on El Morro Rock on the edge of the Zuni Pueblo in New Mexico; later additions to El Morro, which also features earlier pre-European pictographs, include Ramon Garcia Jurado’s 1709 addition echoing Oñate’s, and the inscriptions of American soldiers who visited the site in 1848. 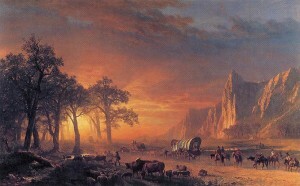 Later examples trace the history of overland American expansion in the 1800s, and include collections of inscriptions at Independence Rock and Register Cliff in Wyoming along the Oregon Trail, The City of Rocks in Idaho along the California Trail, and High Rock Canyon along the Lassen-Applegate Trail from Nevada to California. In more recent times, contemporary inscriptions mark the advent of historical tourism in the West, or even contemporary protest, such as a graffito on the U.S.-Mexico border fence in Nogales, which reads “Fronteras: cicatrizes en la tierra” (“Borders: scars upon the earth”). 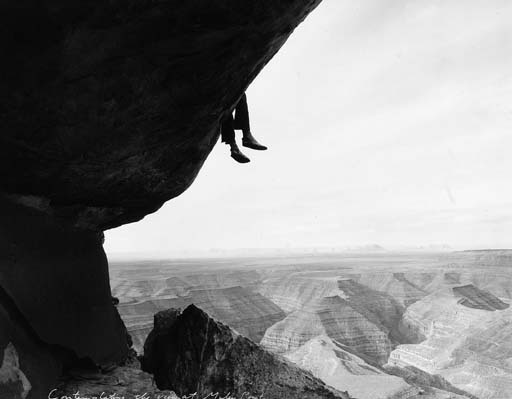 [Figure 1: Newspaper Rock, Canyonlands National Park, Utah. One might wonder, however, about beginning this discussion of Western visual history in a prehistory. In telling about the American West, the question of periodization and the narrative timeline are of special concern. Does the history of the American West begin at that point that it is “The West,” located (as its name suggests) to the west of the expanding American nation? Connected to that question is the assumption that the history of the West is about an encapsulated region viewed from the outside, and, by definition, from eastern perspectives. 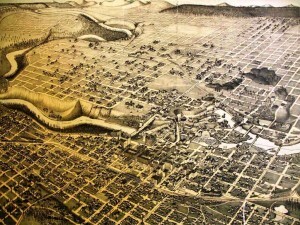 Or, alternately, does the history of the American West begin with the literal ground upon which it is located, in a geological history followed by the paleolithic beginnings of human settlement and proceeding through layers of struggles for possession, first among the First Nations and later among a series of competing empires—the Spanish, French, Russian, English, and only later, Americans? This latter history, which tells the story of the region from within the region, presents the very significant narrative challenge of being long, messy, and containing perhaps too many characters. 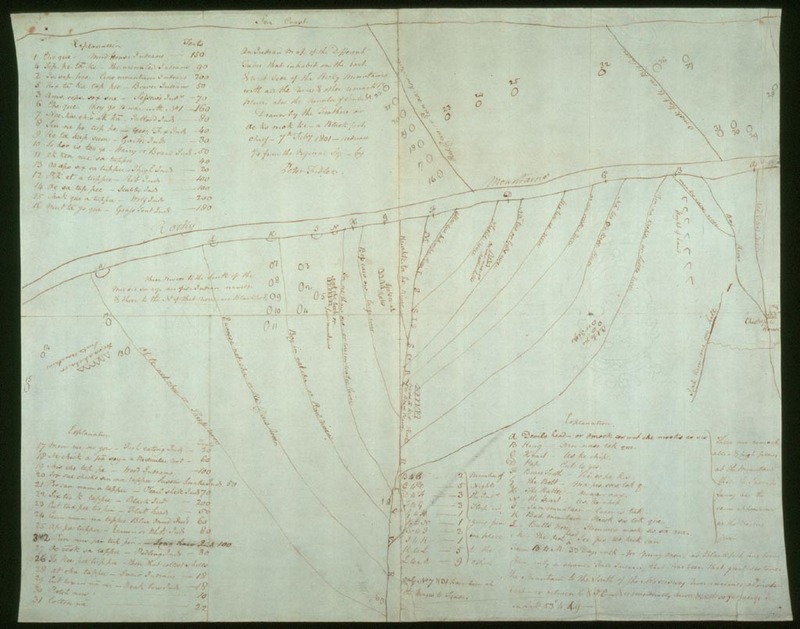 A teacher challenged with teaching about the American West in the context of a national historical survey may therefore prefer the expediency of limiting the narrative to the “Frontier” elements—exploration, settlement, a brief struggle with Native peoples, followed by a triumphal incorporation into the national map, culture, and economy. However, this amounts to teaching myths in the place of history, something that has long been abandoned in the incorporation of other regions and periods into the national historical narrative (see, for example, Peter Mancall’s debunking of the idea that “Colonial America” should refer only to the actions of English settlers in North America in his forum essay). Thus, it is essential for those teaching the history of the American West to understand the power of this myth without perpetuating it. One of the ways to do this is to compare images that were part of the mythmaking process against those that are surprising and countermythical (and often, therefore, less iconic); however, this is not simply with the intent to expose the myth as false. Instead, it is important to understand that many of the mythmaking images were themselves authentic (actually produced without trickery or conscious intent to selectively represent the region) and often contain factually accurate materials for the historian to discuss, even while they also contained symbolisms and evocations that created and perpetuated the myth of the Frontier. Putting aside intentional hoaxes and representations based on hearsay, even figures that fed the myth provide valuable information about the realities of life in the West’s past. 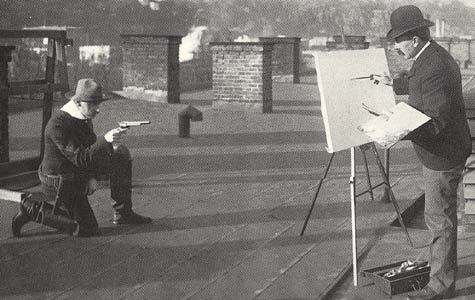 Therefore, the strategy for teaching using these images is not simple dismissal, but instead developing students’ ability to “read” the image on several levels, considering questions about the production of the image and its intentions, as well as the image’s intended and actual audiences and their receptions of the image. Important also are questions about how the image has come to survive or to be classified as a “Western” image rather than, say, simply an “American” one. However, it also presents a mythical angle on European expansion into the region: on the map, all the tribes look the same size, and they are not actually situated securely in specific sites but merely in generalized areas, which implies the view that they are essentially interchangeable as trading partners and that they exist as nomadic, merely regional but not located, groups. 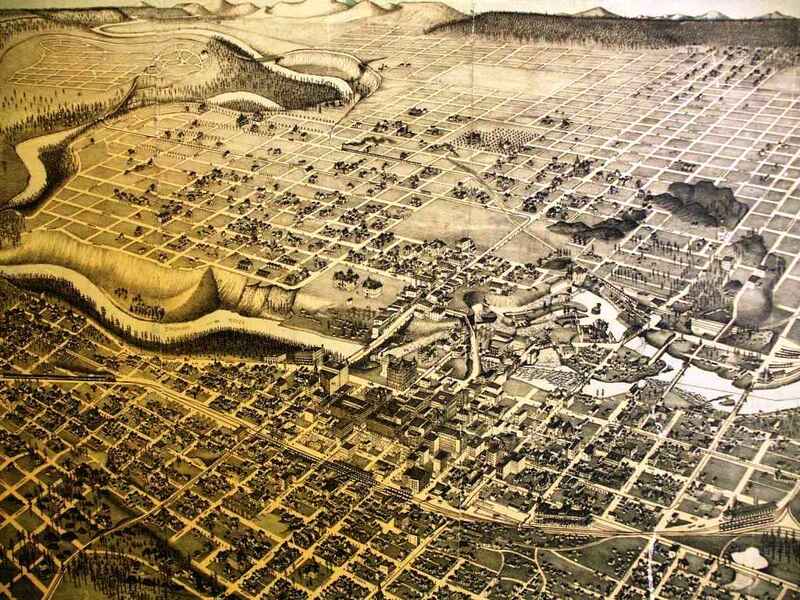 This view, of course, is a myth: the tribes across the Mississippi represented immense cultural and political diversity, intraregional alliances and enmities shaped their willingness to trade with outsiders, and their locations on the land were much more fixed than the image conveys. 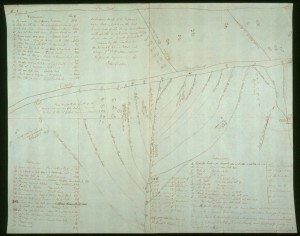 Further, the image also conveys a myth about the actions of traders like those of the Hudson’s Bay Company; despite their commission of a map that seems to provide a mythic presentation of the region, they also collected ethnographic information about the different groups with which they wished to build trading partnerships, as reflected in their surviving archives, and they understood, sometimes all too well, how to take advantage of intraregional alliances and rifts. One of the richest opportunities for examining the myths embedded in the factual accounts in Western visual evidence comes when looking at iconic painted and photographic depictions of Western landscapes. 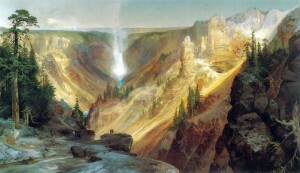 These images are the work of artists who accompanied European exploratory expeditions, such as George Catlin and Albert Bierstadt [Figure 7], or artists and photographers who took part in government surveys, like Thomas Moran [Figure 8] and Timothy O’Sullivan, or even artists who sought out Western vistas as a way to argue for positions as diverse as conservation (Ansel Adams), modernism (Edward Weston), historical preservation (Edward Curtis), or social justice(Dorothea Lange). 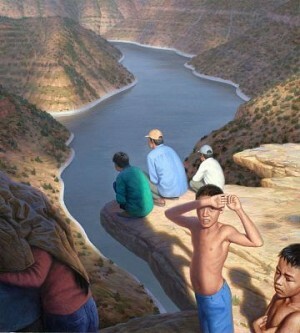 In these iconic evocations, the factual (the real mountains, real environments, even the real people) mixes freely with the mythic (the light of God’s approval shining over American expansion, general emptiness amidst the vastness, the primal and overwhelming Natural, the active Europeans juxtaposed with passive native and Latino peoples, the Indian peoples posed and frozen in a supposedly-authentic cultural moment before the arrival of Europeans). That these iconic images contain both the factual and the mythic does not disqualify them from historical analysis; indeed, this portmanteau effect recommends them as more accurately representing the complicated, messy, and often contradictory region that has been and still is the West. Let us compare Schreyvogel’s painting to two made by artists who had personal experience of what they were painting. 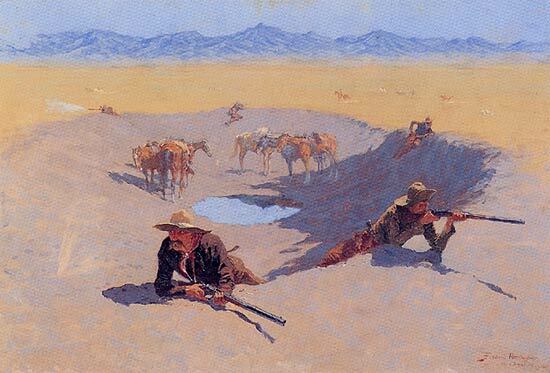 Perhaps the most famous painter of “Western” images, Frederic Remington created a visual version of the Western experience as evocative as the literary one fostered by the great cowboy novelist Zane Grey. Based on his experience in the region, but also informed by his life in rustic upstate New York, Remington provides a more complicated vision of the cowboy. Sometimes clinging joyously to a bucking bronco, sometimes lolling about drunkenly after a visit to town, sometimes a heroic silhouette against a wide, star-speckled sky, Remington’s cowboys run the gamut from innocents to usurpers. More realistically, however, they are pitted in a struggle for survival —against rivals both white and native, against settlers who wish to build fences, against an unforgiving environment where weather and aridity rule. In his 1903 painting, Fight for the Water Hole, he provides two cattlemen aiming their rifles at their enemies, significantly visible but not decipherable within the painting, so that the foe could be a rival gang of cattlemen, or outlaws, or lawmen, or native peoples. 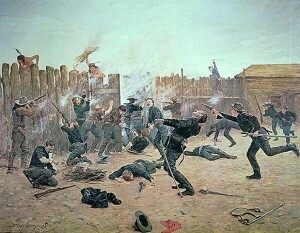 [Figure 11] What matters here is that while they are the visible enemy, Remington indicates a greater foe against which no rifle can defend: thirst. This classic “cowboy” image, on its surface mere cowboy mythology, carries within it a significant historical narrative, about the history of the West as a struggle for scarce resources, control over water, and the way that the western landscape has shaped the lives of those who have lived on it. Finally, the perhaps less-well-known but more authentically-of-the-region cowboy painter, Charles M. Russell, provides an even more exact evocation of the cowboy’s historical experience. His paintings, so specific that they often served as illustrations for his own anecdotes of life on the range, provide precise evocations of Western places and landscapes, and of the cowboys (and women) who lived in them. 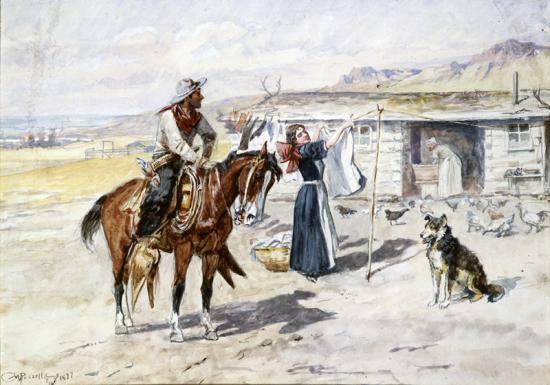 [Figure 12] His Thoroughman’s Home on the Range shows the “cowboy” in his more realistic form: as a wage worker building a little home for himself and his family, surrounded by the tools of his trade (horse, saddle, rope) and the symbols of domesticity (sheepdog, chickens, laundry, bonneted pioneer woman). Even more historical specificity emerges when one notes photographic evidence that a large number of cowboys were African Americans (often former slaves), Indians, “Mexicans” (affected by the shift in the U.S.-Mexico border in the 1840s), and other people who looked nothing like John Wayne. With John Wayne in mind, it would be impossible in a discussion of the visual history of the American West to omit the role that film has played in that recording. 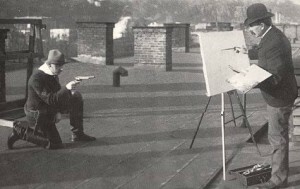 “The Western” has played a central role in the American film industry from its very beginnings (with Edwin Porter’s 1903 prototypical Western The Great Train Robbery—filmed, incidentally, in New Jersey). There is perhaps no other American regional history more entangled in celluloid. The pantheon of great Western films is vast; it includes the classics (Howard Hawks’s 1948 Red River, George Stevens’s 1953 Shane and 1956 Giant), the Spaghetti Westerns of Sergio Leone, and the more recent Neo-Westerns (Roman Polanski’s 1974 Chinatown, Arthur Penn’s 1967 Bonnie and Clyde, Clint Eastwood’s 1992 Unforgiven, Joel and Ethan Coen’s 2007 No Country for Old Men, Paul Thomas Anderson’s 2007 There Will Be Blood, and Jim Jarmusch’s 1995 Dead Man). 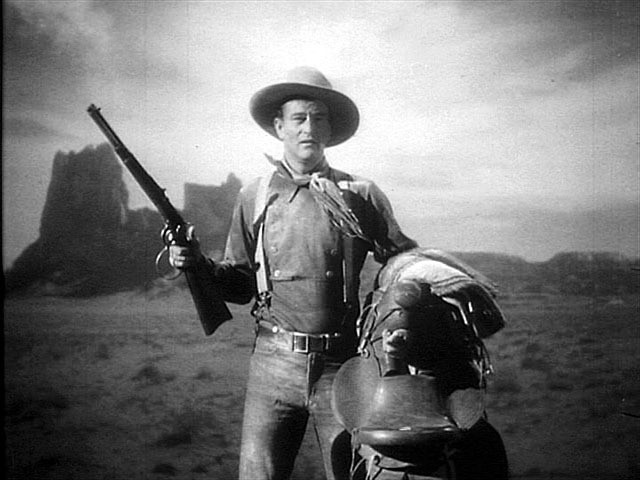 However, the most central figure in creating the visual history of the American West on film would have to be John Ford—notably in his Stagecoach (1939), which made a star of John Wayne. [Figure 13] When asked which among his many films best captured the visual West, the two that leap to mind are The Grapes of Wrath (1940) and The Searchers (1956). Visually, The Grapes of Wrath draws on regionalist painters like Thomas Hart Benton and Alexandre Hogue, as well as the rich visual tradition of the Farm Security Administration photography, especially that of Dorothea Lange and Russell Lee (think, for example, of the scenes of Tom Joad returning home from prison across the dust-strangled fields of Oklahoma, and the haunted, emaciated faces of the migrant camps). 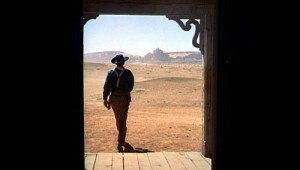 The Searchers, in its panoramic technicolor paean to Monument Valley, draws on the photographic work of Timothy O’Sullivan, Edward Curtis, and Ansel Adams, locating its human characters in harsh relief against an unforgiving and isolating vastness. [Figure 14] While they are also thematically consonant with the history of the West—indicating the roles that ecological crisis and racism have played in shaping the region’s history—it is their visual imagery that most locates them in the region. They could have been filmed nowhere else.